A recent Gartner survey of enterprises indicated that user experience was the most important criteria when formulating application performance strategy. When user experience is reported as poor, discovering the cause of slow application transactions is paramount. But in today’s multi-tier, heterogeneous application architectures, it is challenging to determine what is causing a slowdown: is it the network, or the client, or the database query, or application processing, or an external web service call, etc.? Monitoring of business transactions provides clear visibility into which application tier is slowing down user access to applications and, in turn, affecting user experience. 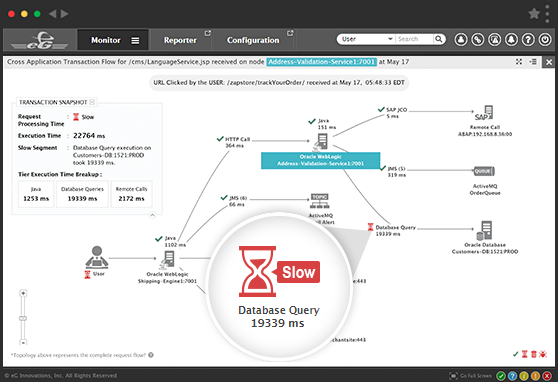 Which application tier is causing slowness? Is there a code-level issue and if so, what line of code, in what method? 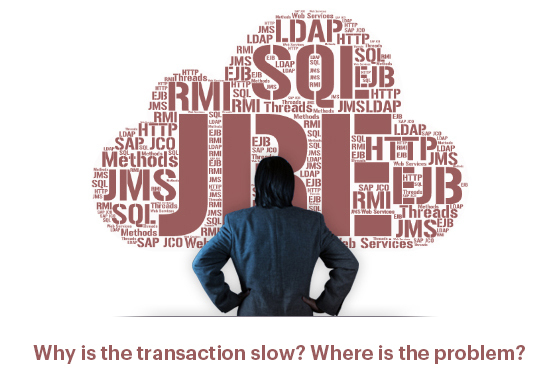 Are there any calls to remote services slowing down the transaction? eG Enterprise provides complete visibility into Java transaction processing in every tier that supports the application. Using byte code instrumentation, eG Enterprise tags every transaction and traces it through the presentation tier, business logic tier and data tier. Method invocations, processing times and any exceptions are captured in the Java tiers, and any calls to non-Java tiers and external services are also tracked. 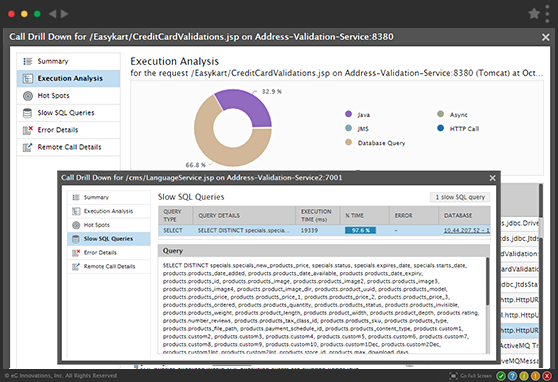 For database accesses, the queries executed and the execution times are reported. Because user experience can be impacted by many factors outside of application performance, eG Enterprise goes far beyond identifying code level issues alone. Its universal monitoring technology provides visibility into every layer and every tier of the infrastructure that the Java application depends on. 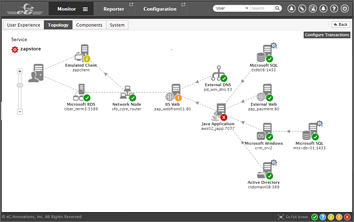 A patented, virtualization-aware, root-cause diagnosis technology automatically discovers inter-dependencies between infrastructure tiers, correlates performance data across these tiers, and pinpoints the exact cause of issues. This eliminates guesswork and finger-pointing and enables IT operations teams, DevOps teams and developers to see exactly where the problem lies and where its effects are. Cost-efficient licensing: Benefit from per-server licensing (as opposed to expensive per-JVM licensing). 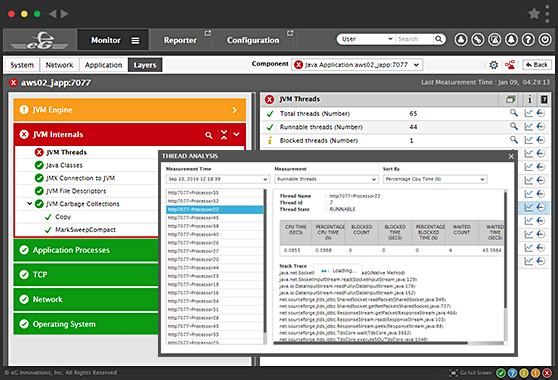 Monitor any number of JVMs on a single server with an affordable per-server license model.